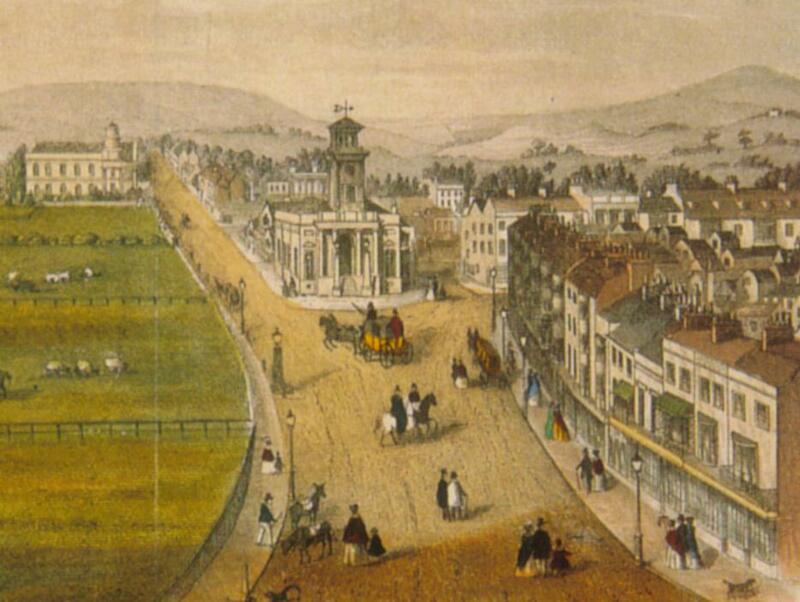 [ABOVE] Worthing in the middle of the 19th Century, a view by the artist G. Atwick, showing South Street leading up to the Town Hall in the centre of the picture. On the left-hand side are the fields of Worthing's Pleasure Grounds, which stretched from Montague Street to Ambrose Place. Around 1858, Harvey Goble (c1822-1867) set up a wooden photographic studio on the Pleasure Grounds opposite Ann Street, just beyond the Town Hall building. [ABOVE] An advertisement for Edward C. Cortis, Photographer, which appeared in The Worthing Monthly Record on 1st May 1855. In this advertisement, Edward C.Cortis offered to take photographs of "Portraits, Landscapes, Public Buildings, Gentlemen's Villas, Favourite Pictures and Prints, Statuary, Models, &c."
[ABOVE] A portrait of Edward Charles Cortis, Worthing's first photographer (c1858). Edward Cortis took up photography in his late teens. 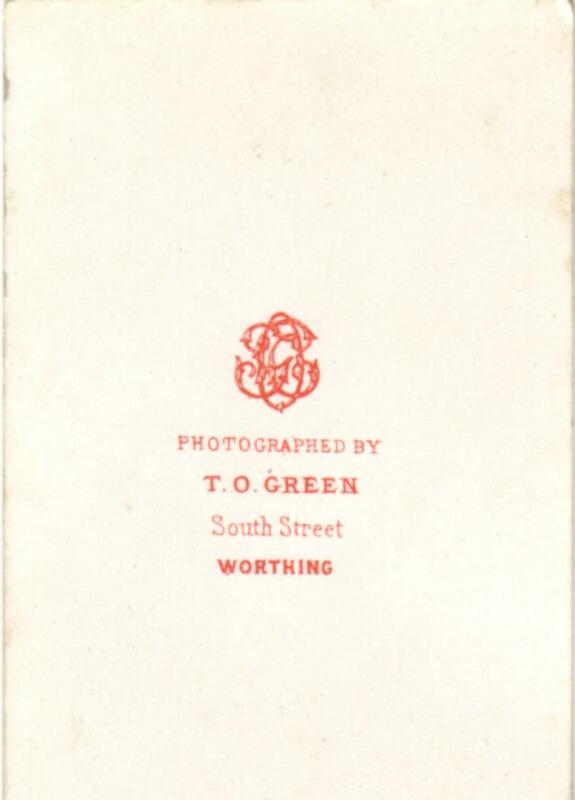 By the Spring of 1855, Edward Cortis was advertising his services as a photographer in Worthing, offering to take views of buildings and portraits with his camera. [ABOVE] An early photograph of Worthing Town Hall and the Town Water Pump (1854). 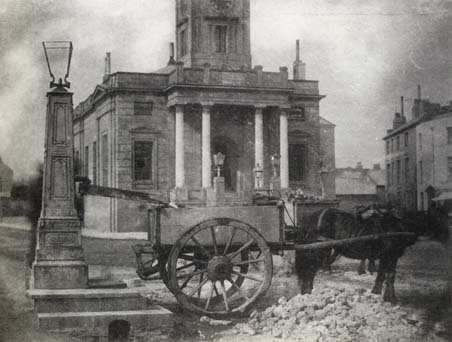 A horse-drawn water cart is being filled by the water pump which was situated at the top of South Street on the eastern edge of the Pleasure Grounds. Taken in 1854, this photograph could be an early view taken by Edward Charles Cortis. Early advertisements mention that Edward Cortis took photographs of "public buildings". 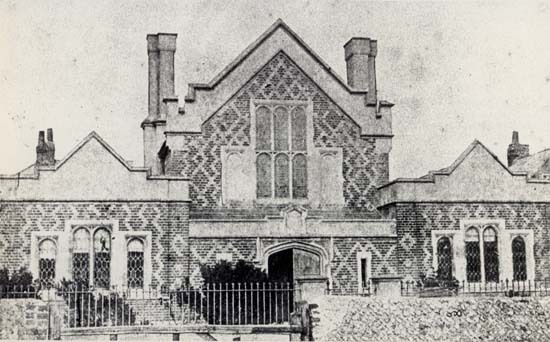 [ABOVE] A photograph of the Worthing Dispensary in Chapel Road, Worthing, taken by Edward Charles Cortis around 1857. This photograph is one of the few images that has been identified as the work of Edward Charles Cortis, one of Worthing's earliest photographers. 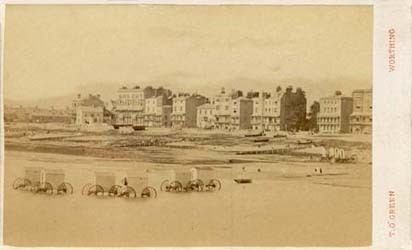 Other images of Worthing which date from between 1855 and 1860 have been attributed to Edward Charles Cortis. These early photographs include views of St Mary's Church, Broadwater, and Worthing Town Hall. [ABOVE] A photographic portrait of William Walter (c1823-1881), a Worthing draper. Born in Marden, Kent around 1823, William Walter set up a business in Worthing around 1846. By 1850, William Walter had established a linen drapery business in Montague Street, Worthing. This early photographic portrait probably dates from the mid or late 1850s. 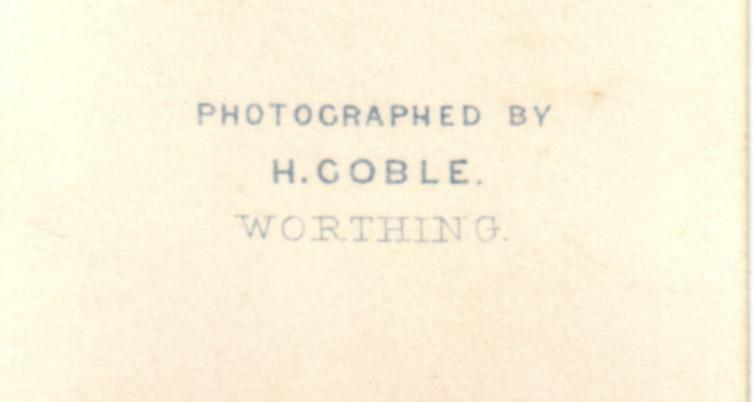 [ABOVE] Harvey Goble listed as a photographic artist in South Street, Worthing, in the 1859 edition of Kelly's Post Office Directory of Sussex. [ABOVE] A photograph of St Mary's Church, Broadwater, attributed to Edward Charles Cortis. 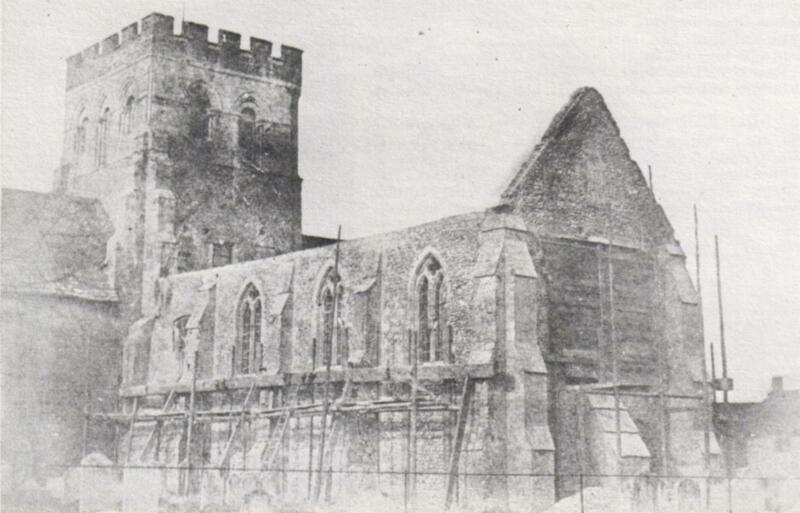 This photograph was taken in 1857 to record the restoration work carried out by Charles Hyde. 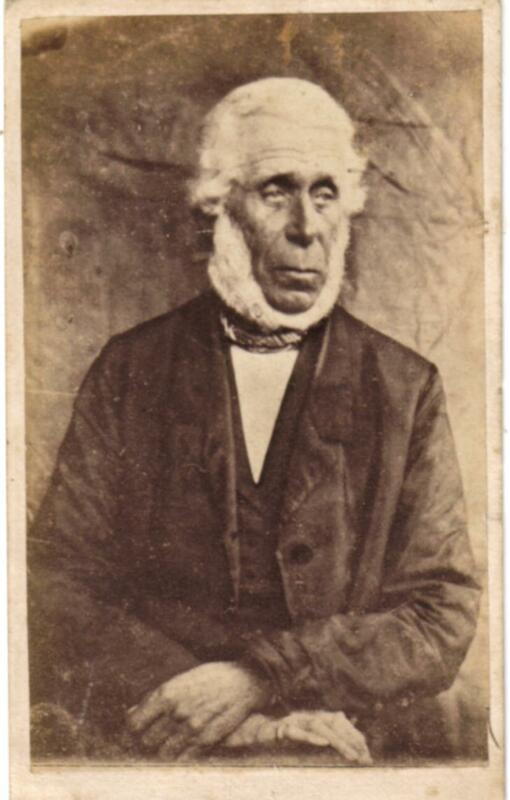 Edward Charles Cortis, the son of a Worthing chemist ,began taking photographic views of Worthing around 1855. Many of the early photographs of Worthing taken between 1855 and 1860 were probably taken by Edward Cortis's camera, but few have been positively identified as his work. 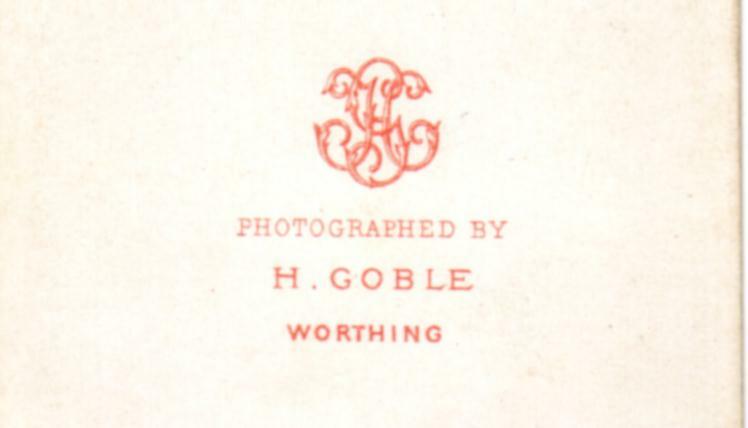 [ABOVE] Harvey Goble listed as a photographer and photographic artist at two business addresses in Worthing in Melville's Directory & Gazetteer of Sussex, published in 1858. Harvey Goble (c1822-1867) was the first inhabitant of Worthing to pursue a long-term career as a professional photographer. Around 1857, Harvey Goble erected a wooden photographic studio on the Pleasure Grounds which bordered Chapel Road and South Street. Harvey Goble's studio was set up on the field alongside Chapel Road, opposite Ann Street. Edward Snewin, an ancient inhabitant of Worthing, recalled that the Commissioners of the town ordered the removal of the wooden studio and "Mr. Goble's studio was put on wheels and taken to Belle Vue." Harvey Goble had business premises in Chapel Road, where he worked as a carver and gilder. 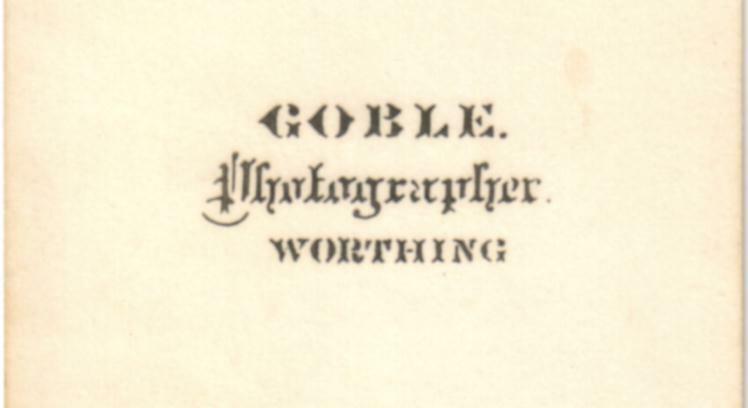 Goble seems to have operated a studio from his shop in Chapel Road, but, in an 1858 Directory of Worthing, he is listed as a photographic artist in South Street and 72 High Street. In French & Son's Handbook and Directory for Worthing, published in 1859, Harvey Goble is listed as a "Photographist" in Chapel Road. At the time of the 1861 Census, Harvey Goble, Photographer, is recorded as living with his wife and five children at 72 High Street, Worthing. In the early 1860s, Goble appears to have been operating a photographic studio from his shop in Chapel Road and from his home in Worthing's High Street. [ABOVE] A carte-de-visite portrait of Mr D. Lewis by Harvey Goble of Worthing. [ABOVE] Three trade plate designs used by Harvey Goble on the backs of his carte-de-visite portraits between 1862 and 1867. 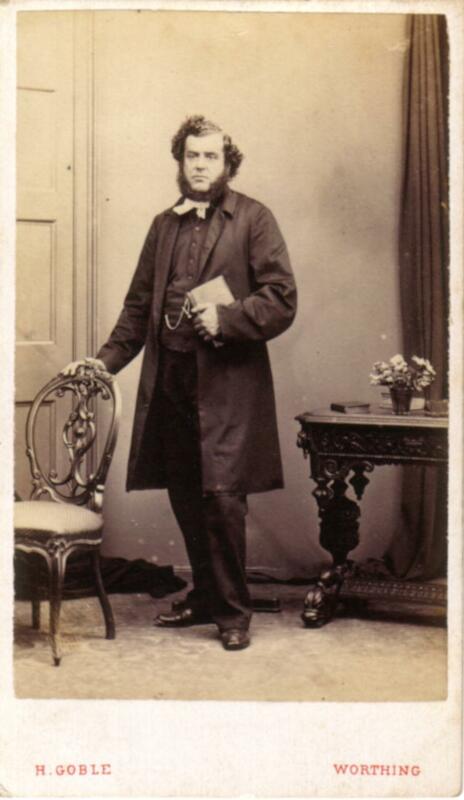 William Barrett (1829-1863) was an itinerant photographer who arrived in Worthing around 1860. A native of Bradford, Yorkshire, William Barrett had worked as a photographer in York, Durham and Worcester before reaching Sussex around 1858. He stayed in Chichester for a number of months before moving on to Worthing, where his daughter Julia was born on 5th May,1860. 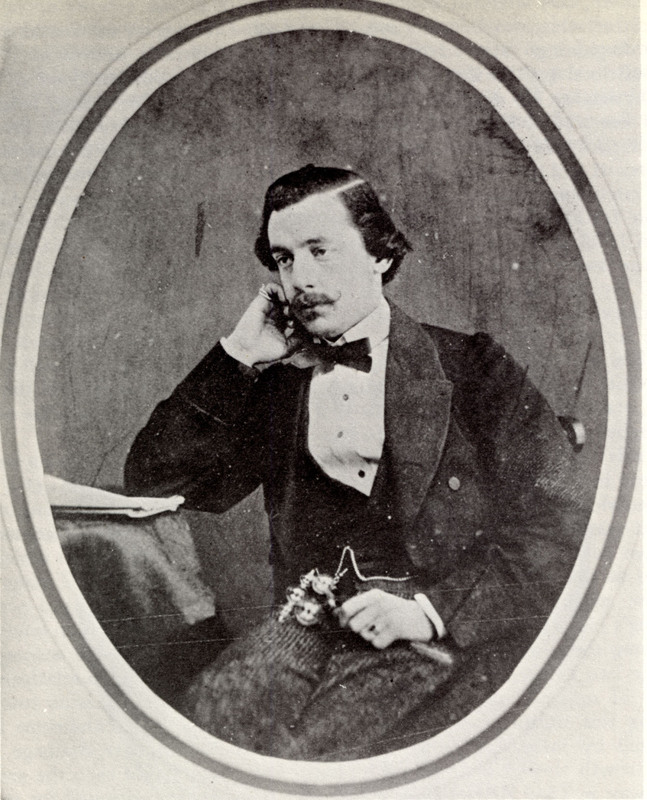 William Barrett remained in Worthing for less than a year, but when he died of an "aneurism of the heart" in February 1863, an obituary noted that he was "well-known" as a "photographist" in Worthing, so he might have made regular trips to the neighbouring seaside resort after he and his family had settled in Bognor in 1861. William Barrett died in Bognor on 2nd February 1863 when he was in his early thirties. 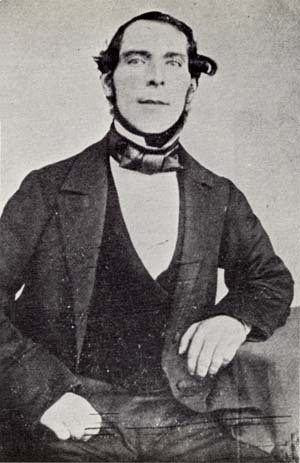 Samuel Fox (1801-1867) had been born in Workington, Cumberland, at the beginning of the nineteenth century. In his advertisements, Samuel Fox proudly stated that he was " one of the OLDEST and MOST EXPERIENCED PHOTOGRAPHERS IN ENGLAND ". It appears that Fox was working as a daguerreotype artist in Ireland in the early years of photography, from around 1843 to 1846. Samuel Fox had married an Irish woman and his first two daughters were both born in Ireland. After a period in Ireland and possibly a spell as an itinerant photographer, Samuel Fox arrived in Sussex around 1850 and set up home in Fishbourne, a village situated a mile and a half from Chichester. 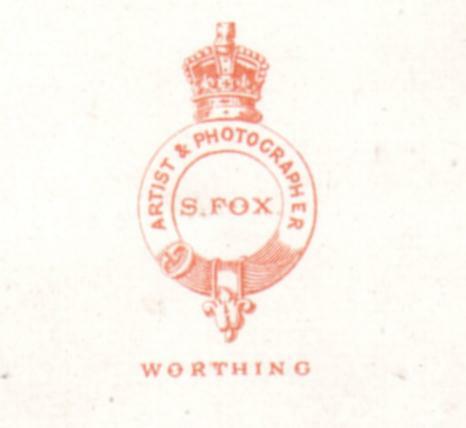 By 1859, Samuel Fox had settled in Worthing. 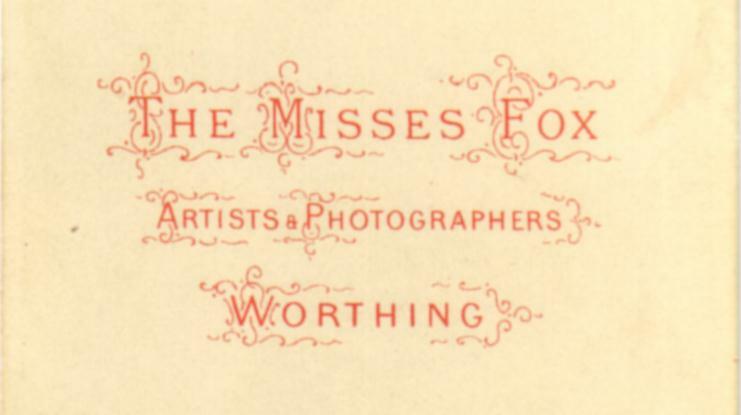 In an advertisement placed in French & Son's Directory of Worthing, published in 1859, Samuel Fox announced that "Portraits by every known process" would be taken daily at his studio, The Worthing Photographic Institute in Bath Buildings. This studio, which became known as Bath House, Bath Place, was to be the location of a photographic studio for the next fifty years. [ABOVE] A carte-de-visite portrait of a gentleman in a top hat by Samuel Fox of Worthing. 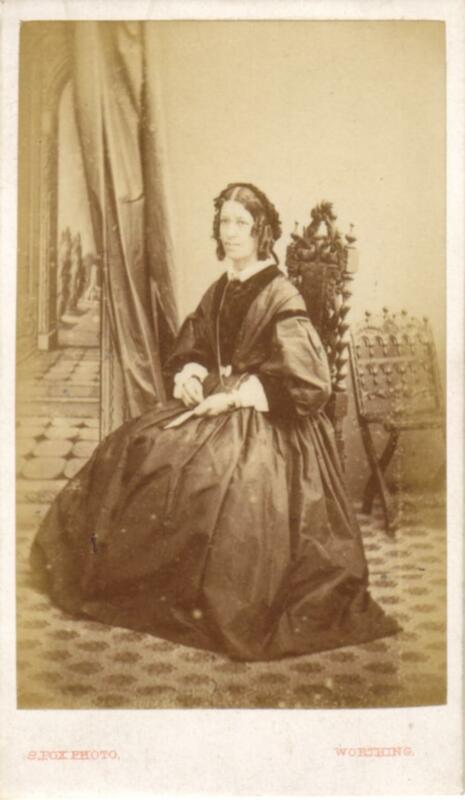 [ABOVE] A carte-de-visite portrait of a seated woman, taken by Samuel Fox of Worthing around 1867. [ABOVE] Two trade plate designs used by Samuel Fox on the backs of his cdvs between 1862 and 1867. Charles Joseph Wright ( born c1823 ) began his working career in Worthing as a tobacconist. Born in London around 1823, Charles Joseph Wright was running a tobacconist shop at No.3 South Street, Worthing from around 1850. Charles Wright's wife Mary was an "embroideress" by trade and in the late 1850s a '"Berlin Wool Repository" had been added to his business premises in South Street. 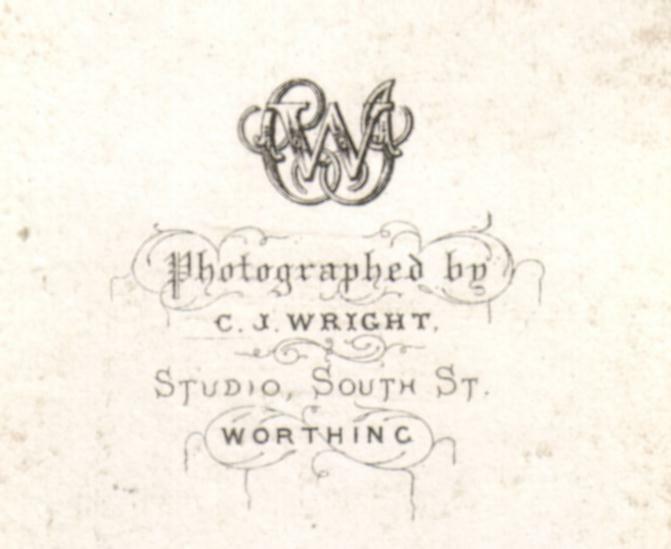 By 1859, C. J. Wright had established a photographic studio at 3 South Street, Worthing. In the 1861 Census, Charles J. Wright gives his occupation as "Photographer & Tobacconist", but as the years went on, the production of photographic portraits became his main source of income. Forty years later, in 1901, Charles Wright informed the census enumerator that he was a "Retired Photographer", aged 78. 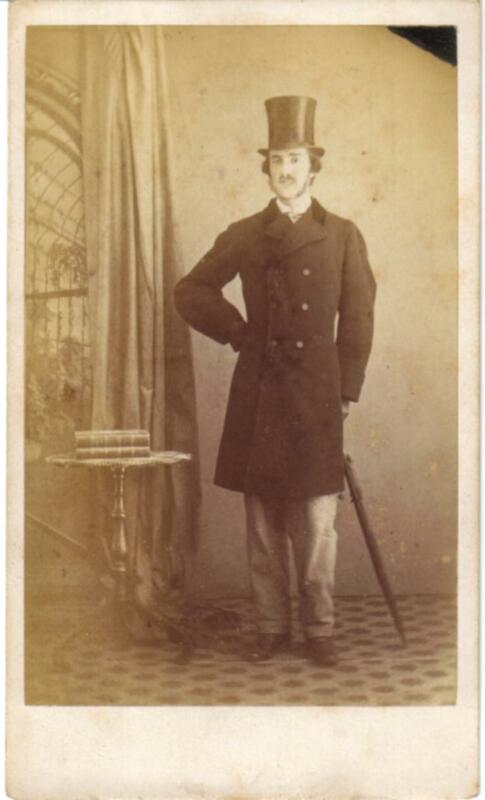 [ABOVE] An early carte-de-visite portrait by Charles Joseph Wright of Worthing (c1862). Wright's early portraits do not feature the elaborate painted backdrops he used in the mid 1860s. 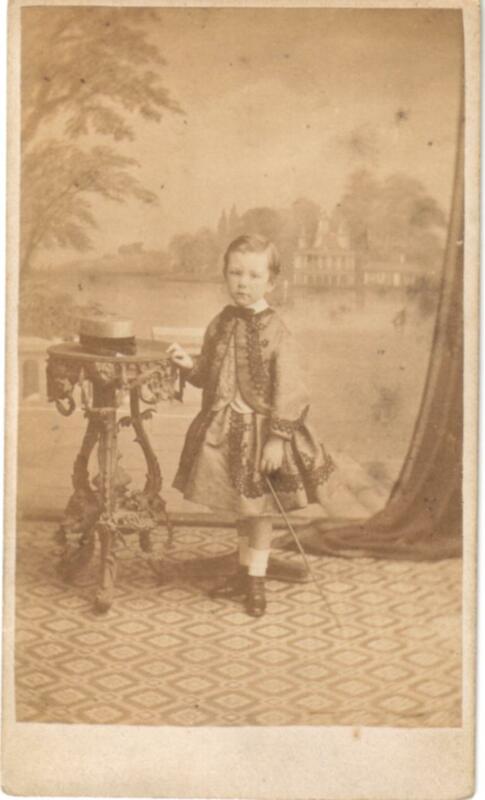 [ABOVE] A portrait of a young boy in a skirt, photographed by Charles Joseph Wright of Worthing around 1865. [ABOVE] Two trade plate designs used by C. J. Wright on the backs of his carte-de-visite portraits between 1862 and 1870. Richard Blair ( born 1837, Worthing ) is not recorded as a photographer in Worthing until his listing under the heading of "Photographic Artists" in a Sussex trade directory of 1862. 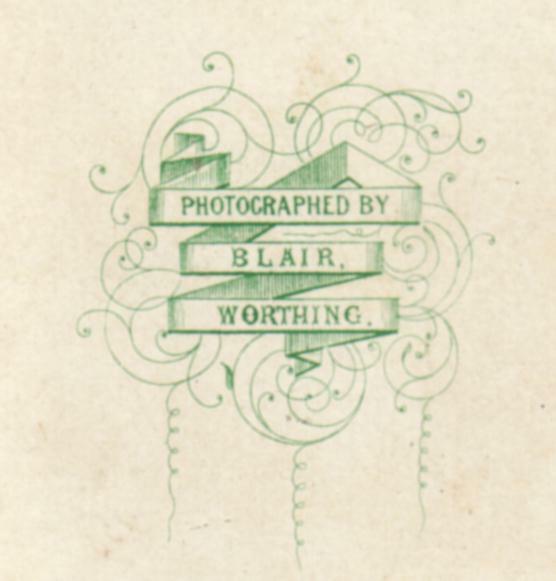 Richard Blair operated a photographic studio in South Street, Worthing for the next eight years. 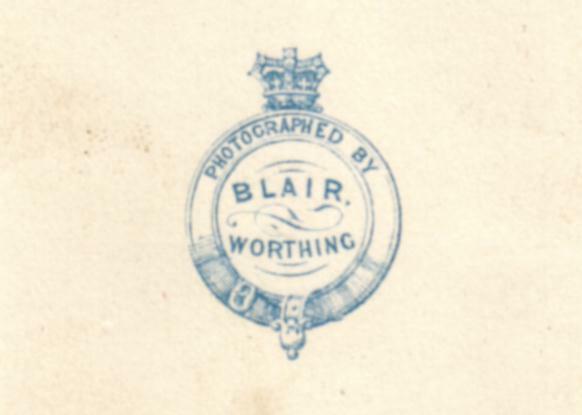 In 1870, Blair opened a new studio at 2 Montague Street, Worthing. 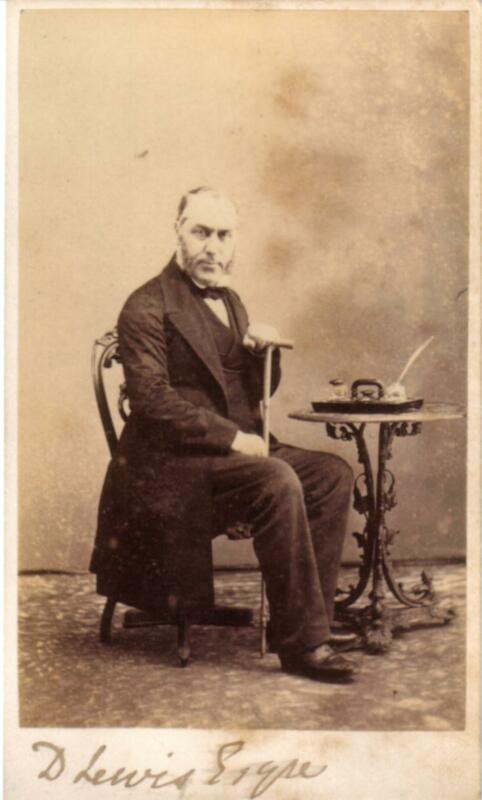 [ABOVE] Portrait of Charles Browning, a carte-de-visite by Richard Blair of Worthing (c1865). 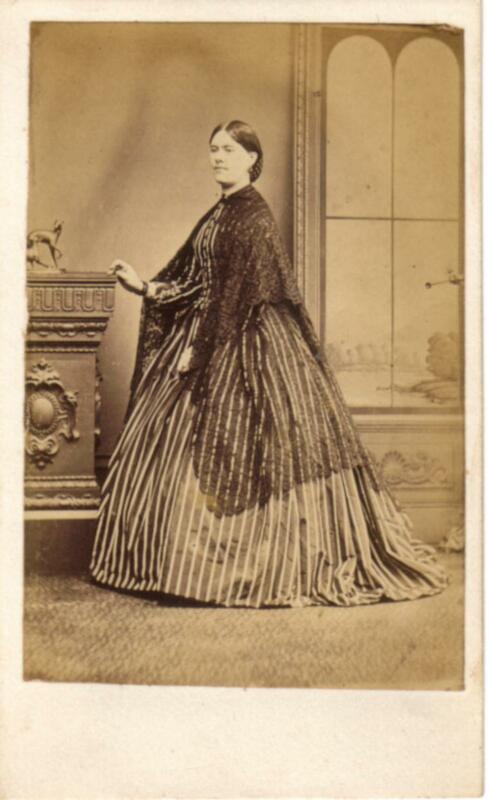 [ABOVE] Carte-de-visite portrait of a young woman, photographed by Richard Blair of Worthing around 1865. [ABOVE] Two trade plate designs used by Richard Blair on the backs of his cdvs between 1862 and 1870. 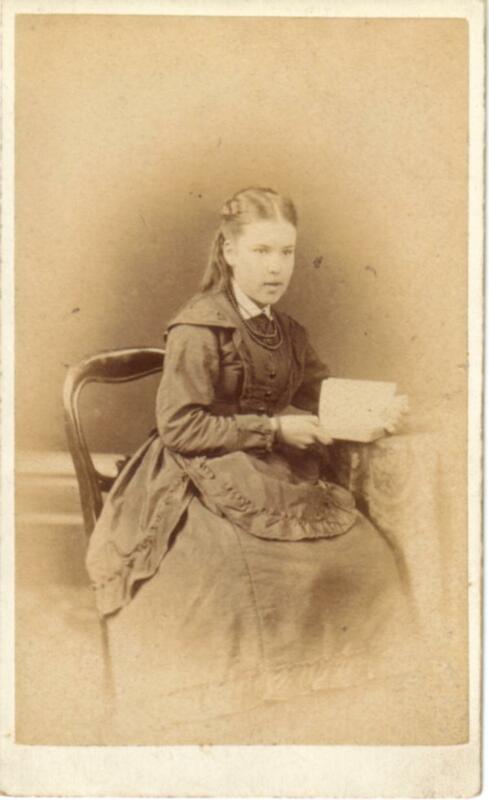 [ABOVE] Portrait of a seated girl holding an open book, a carte-de-visite by Josiah Russell of Worthing. 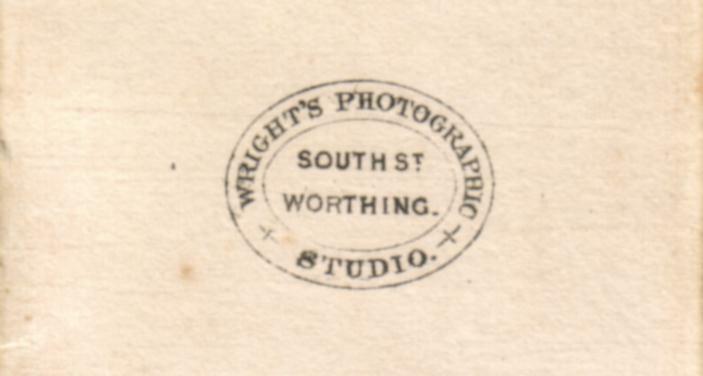 In 1862, four Worthing photographers were listed in the Trades Section of the Sussex Post Office Directory - Richard Blair in South Street, Samuel Fox at Bath Place, Harvey Goble with one studio in Chapel Road and another in the High Street, and Charles Joseph Wright at No.3 South Street. Ten years later there were still only five permanent studios in Worthing. ( In 1871, Brighton had at least 32 studios and over a hundred individuals engaged in the business of photography ). Three of Worthing's original photographers had died during this period. William Barrett had died in 1863 at Bognor, and both Samuel Fox and Harvey Goble had passed away in the year of 1867. 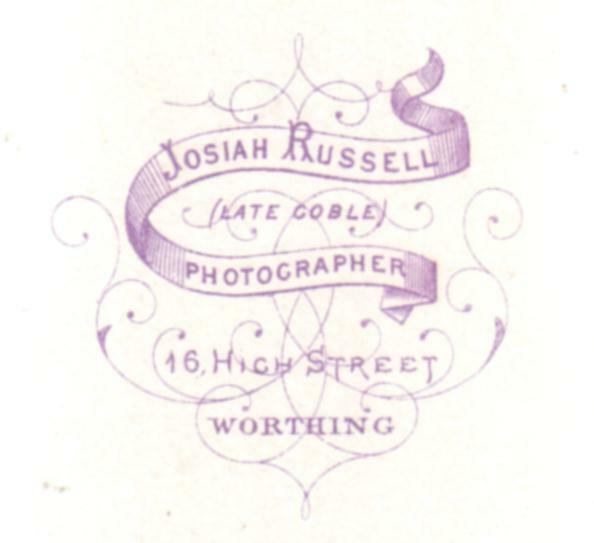 Josiah Russell (born 1840, Chichester), one of the sons of the well known Chichester photographer James Russell of Chichester, took over Harvey Goble's business in the High Street. Samuel Fox's studio in Bath Place was continued by his two eldest daughters, Annette & Blanche Fox. A new studio at 40 South Street was operated over the years by members of the Green Family from Woolwich. 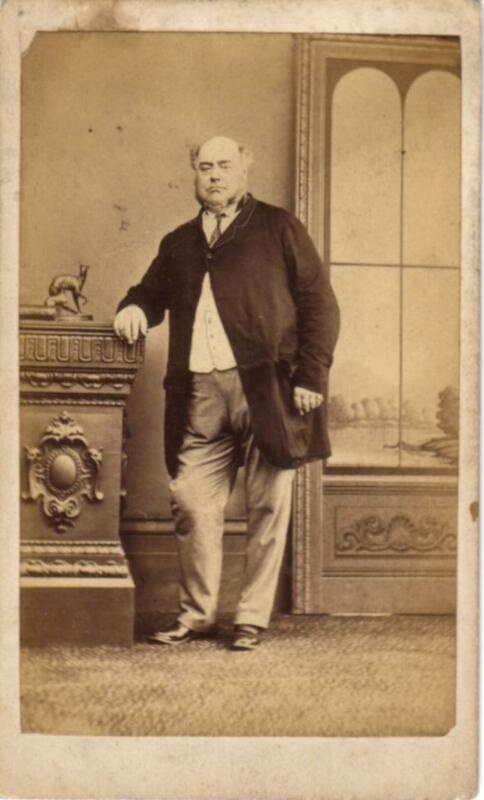 The head of the family and the first proprietor of the studio was the photographer Thomas Oliver Green (c1843-1924) and in 1871 he was assisted by his younger brother Christopher Green (born 1856, Derby). [ABOVE] The trade plate of Annette Fox and Blanche Fox, the two sisters who went under the name of "The Misses Fox". [ABOVE] Worthing Seafront, a topographical carte-de-visite by Thomas Oliver Green of South Street, Worthing (c1870). 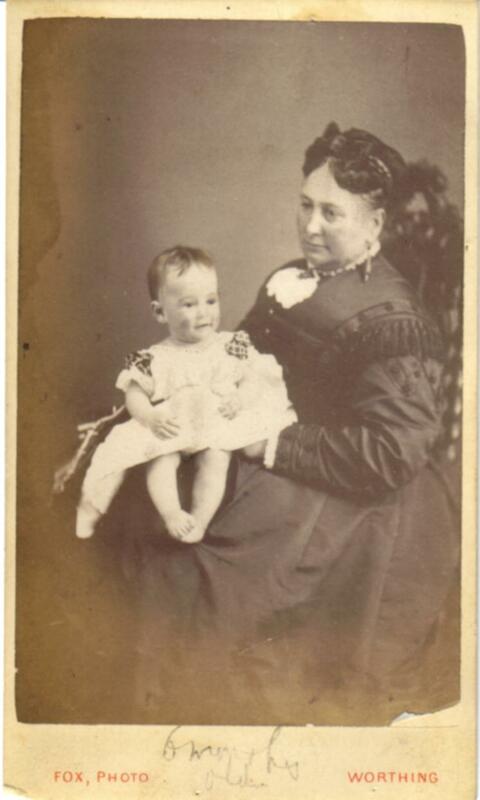 [ABOVE] Portrait of a young child, aged "six months", sitting on a woman's lap; photographed at the Bath Place studio run by Samuel Fox's two daughters, Annette and Blanche Fox. 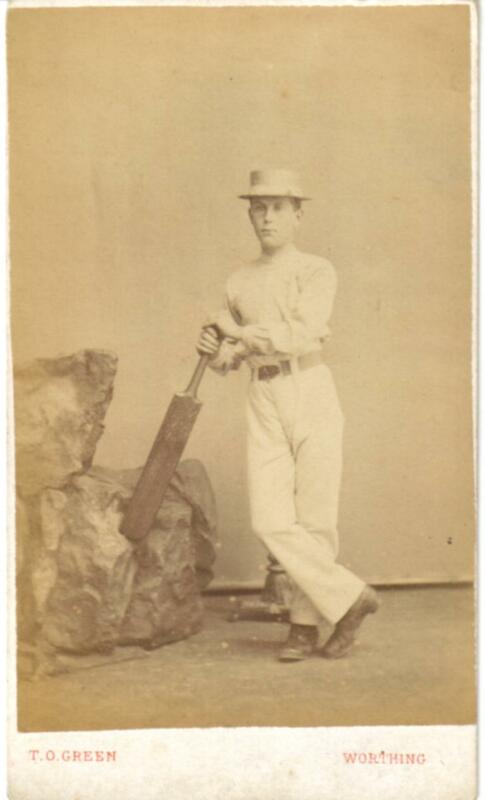 [ABOVE] Portrait of a young lad holding a cricket bat, a cartes-de-visite by Thomas Oliver Green of South Street, Worthing. [ABOVE] The trade plate of Thomas Oliver Green of South Street, Worthing. 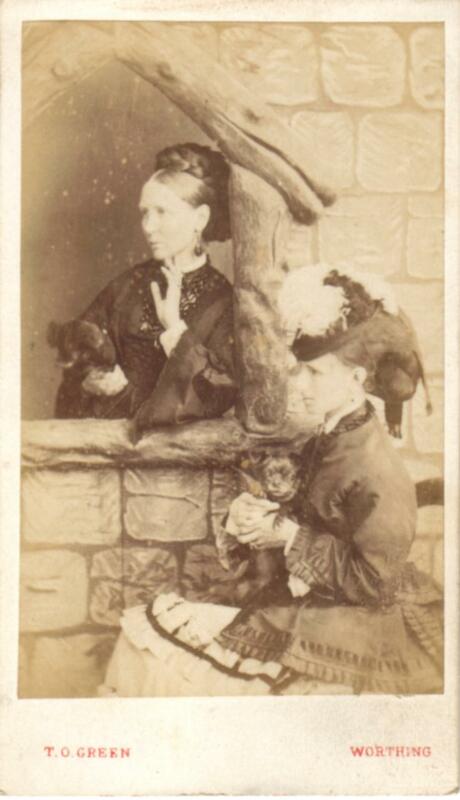 [ABOVE] Portrait of two women holding puppies and posing by an artificial window by Thomas Oliver Green of South Street, Worthing.